Who Sharps Are Betting In CFB Playoffs / Who Does Brent Have in NFL Week 17? Busy weekend of sports betting . . . I hope this email has a little something for everyone. College Bowls . . .
Notre Dame is 6-2-1 against the spread since awarding the starting quarterback position to Ian Book. That’s a 75% success rate. An enduring “old school” theory in sports betting is that there’s never any value on high profile teams like Notre Dame because the public loves betting them. The public’s been “beating the book with Book” so far. Notre Dame will likely close as underdogs in the area of +12.5 to +13 to powerful Clemson in Saturday’s Cotton Bowl (ESPN, 4 p.m. ET). For its part, Clemson is 7-2 ATS in games Trevor Lawrence has finished since winning the starting quarterback job. He was injured early in a non-cover nail biter against Syracuse. When Lawrence is healthy, Clemson has been a true juggernaut. Fantastic defense was a given, then coupled with big offensive production under Lawrence. Oklahoma is the only “overrated” team in the final four, if you accept the premise that a well-informed, liquid betting market defines how teams are “rated.” The Sooners went 5-7-1 ATS, largely because a very soft defense allowed too many opponents to hang within striking distance. Sharp preferences in the national semifinals are pretty well defined after weeks of betting. The public will make its presence felt on game day…as fans will treat both games like virtual Super Bowls . Sharps bet Clemson hard at -11 and -11.5, less hard -12, and -12.5. Math-minded approaches in particular were showing Clemson’s stellar defense derailing dreams of a high scoring shootout. But Notre Dame money did arrive with authority at +13. This is an underdog the public will bet (“squares” typically prefer favorites). And, sharps have done well with the Irish this season. Price is always important to pro bettors. Looks like 12.5 is where sentiment shifts. Some sharps bet Alabama for value at the opener of -13.5, just below the key number of 14. But support dried up after the move. That suggests most sharps are looking to take Oklahoma…and are hoping the public drives the line up to +14.5 (or more). Dog lovers will settle for +14 if that’s the apex. It’s easier to like the dog after Georgia took Alabama to the wire in the SEC Championship game, particularly with a Heisman Trophy winning quarterback for OU that could score a garbage-time TD down 17-20 points in the final minutes if needed. VSiN betting previews for all 5 bowl games today here. And make sure you tune into Betting Across America (10 a.m.-Noon ET) from our studio at the Ocean Resort Casino in Atlantic City. Michael Lombardi and Jonathan Von Tobel will have full coverage of today’s bowls, including interviews with SEC/ESPN analyst and former Gator Chris Doering, Yahoo Sports college football reporter Pete Thamel and former Oklahoma star DeMarco Murray. Washington St. holds off Iowa St. 28-26 in Alamo Bowl: ViewFromVegas is the Cyclones got the back-door cover after closing as 2.5-point underdogs (stayed Under 57); faves are 15-7 SU & 13-9 ATS in CFB bowls; Overs dip to 11-10-1. Syracuse pulls away to beat West Virginia 34-18 in Camping World Bowl: Orange closed as 3-point favorite after being +7 before Will Grier decided to skip bowl (stayed Under 67.5). Auburn routs Purdue 63-14 in Music City Bowl: Tigers also covered as 3.5-point favorites (went Over 58). Big Bets . . .
One MGM bettor put $525K on Alabama moneyline -550, to win $95K. He also bet $125K five-team moneyline parlay of Georgia -600, Alabama -550, Patriots -850, Seahawks -950 and Chiefs -900 that wins $111K. He wrapped it up with $50K on 3-team moneyline of Georgia/Bama/Patriots to win $27K. So $700K total, spread over three wagers. Another MGM bettor was approved for $250K on Syracuse, but didn’t play it. Instead he jumped on the Alamo Bowl with a total of $275K over two bets on Iowa State moneyline. $100K at +115, and $175K at +110. Patrick reports that with the high rollers just arriving for the long New Year’s Day weekend, there will be plenty more big bets today. Brent makes the case for taking the Raiders and the points vs. the Chiefs. 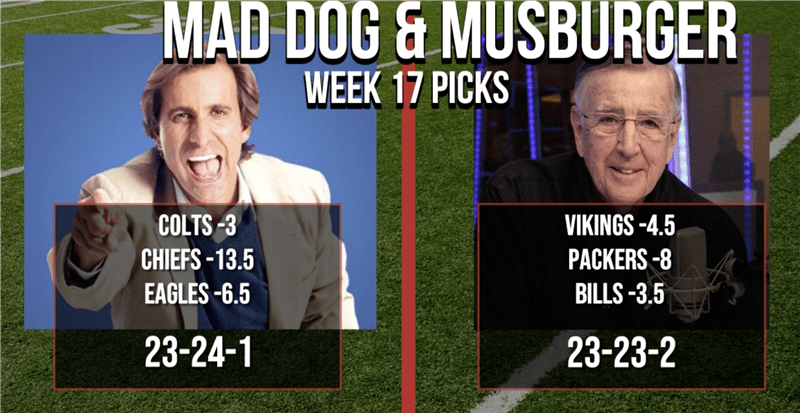 He was on his way to KC on Friday, but left his picks with Vinny for their weekly handicapping contest vs. Mad Dog Russo. VSiN subscribers can watch the segment here. Here is a hint of how it went. What we don’t know yet? Brent’s SuperContest picks. VSIN will announce the consensus picks for the final week of the Westgate SuperContest at 2:45 p.m. ET. We also will publish every pick for every team, posting them here. Jon Jones returns to the Octagon tonight (PPV, 10 p.m. ET) in UFC 232 in an attempt to recapture the light-heavyweight title he was forced to vacate after testing positive for performance-enhancing drugs. In this card moved to Los Angeles because Nevada wouldn’t license him, Jones faces Alex Gustafsson, who fought brilliantly in their first fight in 2013 and outpointed Jones for three rounds before being elbowed in the fourth and losing a five-round decision. Gustafsson’s size provides him the length needed to compete with Jones, but he does not possess the power to hurt Jones. In that first fight, the best performance of his career, Gustafsson caught a “ripe” Jones, who had been training more in the Albuquerque bars than in the gym. Gustafsson will try to employ constant movement and counterpunching much as he did in their first fight as this is his sole path to victory, via decision. Jones will take this fight to right to Gustafsson. The play: Jones -255 over Gustafsson (+225). Under 4.5 -115 available at the Westgate. Want more? Lou was on The Edge with Matt Youmans and Erin Rynning. "Baltimore has to become a little bit more like Oklahoma and let the kid throw it." The aforementioned Michael Lombardi discusses Lamar Jackson and the Ravens’ gameplan with Mitch and Pauly. As the guys evaluate a handful of NFL Coaching Props, Mitch volunteers to shave his head if Vance Joseph keeps his job in Denver. The Gold Sheet editor Bruce Marshall likes a side and moneyline play in Tuesday’s Fiesta Bowl when LSU meets UCF in Glendale. Westgate Superbook Race & Sports Director John Murray shares his CFB playoff predictions and where he expects the championship game line to open. “Action creates action” That’s the South Point’s Chris Andrews has to say about the upcoming weekend handle. Chris was on My Guys in the Desert with Dave Farra, Vinny Magliulo and Amal Shah. The NFL’s final week of the regular season is our cover story with the Steelers on the playoff bubble. My feature article of the week covers an interesting angle on Week 17 games, aka the dreaded “resting starters” games. The Saints and Chargers will have nothing to play for on Sunday in terms of enhancing their playoff prospects. The problem is that several other teams could join them by the time their games kick off. Does that mean that bookmakers won’t be offering point spreads for their contests? Heck no, and the purpose of my article is to look specifically at those “meaningless” games, revealing some surprisingly distinct trends that might help you might some winners. Issue #18 of the PSW also will be handling all the big college bowl games through the New Year. Among those bowl contests are all of the New Year’s Six games. My college feature article digs deeper into the trends and betting systems affecting those contests. These games are the showcase contests on the bowl schedule each year. With greater stakes, the way the teams prepare for these games is much different than the other bowls. This, of course, can lead to great handicapping opportunities. Don’t overlook our NBA, NHL, College Hoops and MMA coverage in Point Spread Weekly. 10 a.m.-noon ET/7-9 a.m. PT: Betting Across America with Jonathan Von Tobel and Michael Lombardi from Ocean Resort Casino in Atlantic City, N.J.
Noon-4 p.m. ET/9 a.m.-1 p.m. PT: The Green Zone with Brady Kannon, Sam Panayotovich, Kenny White. 4-6 p.m. ET/1-3 p.m. PT: Inside the Numbers. The best NFL handicapping information from VSiN all wrapped up into one show.